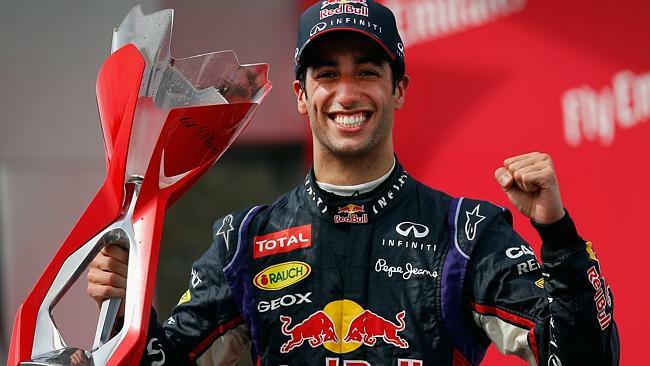 Daniel Ricciardo passed a limping Nico Rosberg to take the flag with just two laps to go, going on to claim his first Formula One win and some much-needed high points for the Red Bull team this season. Rosberg impressively managed to hold on to second place, hindered by his loss of MGU, he was aided eventually by a last lap safety car appearance after a high-speed collision in turn one between the Felipe Massa and Sergio Perez. Sebastian Vettel, luckily avoiding involvement in the last lap incident, went on to take third and completed the podium. Another shock on the final time sheet was a fourth place finish from Jenson Button, who passed Nico Hulkenberg and Fernando Alonso in the penultimate lap to be held in position by the safety car and claim a well deserved position for the McLaren team, something missed by most in the drama that was unfolding at the front of the pack. At the other end of the grid, it was a disappointing race for Marussia who entered this weekend buoyed by the teams first points in Monaco after a great performance by young Ferrari prodigy Jules Bianchi. There was no such celebration this weekend, however, as Chilton slid into his team-mate on the first lap ending the race for both drivers before it had even began. The start of the race began with the two Mercedes pulling away from the pack, as is de rigueur this season, to engage each other in the race for the top step. Rosberg defending position heavily on the second turn causing Hamilton to run wide and lose a place to the Red Bull of Sebastian Vettel. Then came the first safety car, out on track after the collision between the Marussias, which ailed the fears of those teams running on the fuel limit. At the restart Rosberg caught a snoozing Hamilton to gain a 1.7s lead which put him safely out of DRS range a few laps later. Vettel, on the other hand, found himself well within range, and a few laps later he was quickly dispatched on the penultimate straight by a DRS wielding Lewis Hamilton. It was as the race reached the half way mark that the wind changed, with both Mercedes simultaneously reporting a sudden loss of power to a manic Mercedes pit wall racing to rectify the problem from the garage. Hamilton held out for a few laps but the tell-tale smoke began to appear from the rear wheels of his Mercedes Hybrid as his brakes failed upon a passing attempt in the final chicane. His race was over, and he nursed the car back around the circuit once more to retire to a disappointed garage. A late stop forced Massa to the back of the leading pack. Having been forced to swap boots by mediums that had run their life he was ultimately gifted sheer pace toward the final laps as he found himself on much fresher rubber than the others. He caught the leaders by almost 1 second per lap after passing team-mate Bottas and the slowing Force India of Nico Hulkenberg, ready to fight for the first Williams podium of the 2014 season. Ricciardo made a successful attempt on Sergio Perez who was suffering from similar electrical and braking issues as the Mercedes duo, and pulled away to take the fight to Nico Rosberg in the closing stages. It didn’t take long for the young Australian to catch up and attack under DRS on the back straight. The final safety car sealed the deal. After Massa and Perez came together in a spectacular fashion on the final lap into turn one the race order was settled. Button was followed by the Ferrari of Fernando Alonso, seemingly invisible throughout the race, who was followed by a weary Valtteri Bottas in the other Williams, which was delivering similar Mercedes power-train issues. 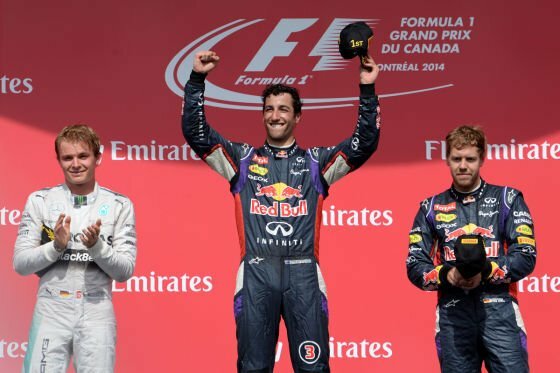 Jean-Eric Vergne, Kevin Magnussen and Kimi Raikkonen filled the final point scoring positions in yet another exciting Canadian Grand Prix.